KGSX10 type liquid filling and capping machine is the main equipment of liquid filling production line, the main working principle is to adopt imported microcomputer to control peristaltic pump pulsating frequency, the liquid is filled into the bottle as per requested amount, and then the capping process is done automatically. Its main structure is composed out of bottle feeding station, peristaltic pump filling station, cap oscillation station and capping station, conveying mechanism and control system. 1) Bottle feeding and exiting station: it is composed of the bottle turn table, and bottle feeding auger and bottle receiving table, it is for antibiotic vial buffer before filling, and bottle receiving after capping. 2) Peristaltic pump filling: there are ten peristaltic pumps for filling, microcomputer is used to control frequency, thus peristaltic pump filling volume is accurate. At the same time, a liquid suction device is used to suction the liquid in the filling needle after filling, It functions like this: the filling needle will rise along with the level in the vial, when the filling is completed, liquid in the needle will be suction back to the hose tube, and the suction amount could be controlled by stepping steps. In the filling process, there is no leakage of liquid. 3) Control system: adopt variable frequency motor for variable frequency speed control. Since the filling amount is adjusted through stepping motor through microcomputer, the filling amount could be adjusted without machine stop. No bottle no filling, machine stop or auto alarming, no cap automatic machine stop. It is equipped with automatic frequency controller, bottle automatic counting. The liquid filling system equipped with anti-drip settings. Automatic bottle feeding, liquid filling, capping. The capping station features with adjustable speed, accurate positioning, reliable capping, stable operation, low noise and low damage caps rate. The bottom table rotates driven by the reducer, and it will drive the turn table through the tracking pole, the small gear on the rotation heads will rotate along with big gear the rotation heads will move up and down with the cam curve. 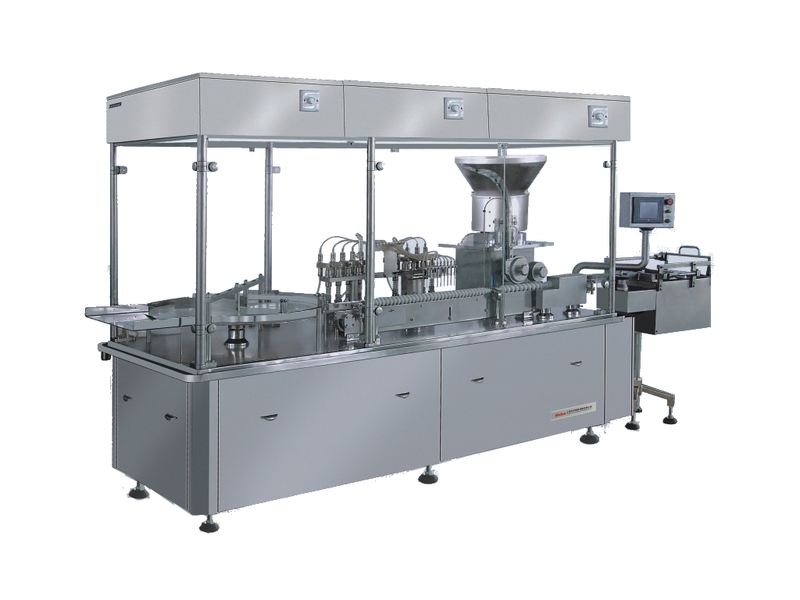 The bottle are fed into the expected position along with the track, cam mechanism will hold it tight, the cap is fed by cap arrangement system and fed into capping device, the rotation head will bite the cap and press onto the vial. This station is composed of cap rotation mechanism, cap arrangement system, transmission system, tracking device, lifting cam, holding cam, spiral feeding mechanism, rotation shaft, expansion wheel, tracking pole, main frame, reducer etc, the structure is compact, reasonable layout, easy for maintenance and dissemble. A. Capping mechanism: the capping head is main components. It is composed of a spring, a guide sleeve, a positioning sleeve, bearing, claws, and other parts. B. Cap Arrangement system: it is composed of cap arrangement device, and a linear chute, pneumatic control system. The system directly affects the production line speed. C. Transmission system: the shaft and chain wheel of the transmission system adopt quality stainless steel and carbon steel, carbon steel has been heat treated and chrome plated, so it could meet the the special requirements for material of pharmaceutical industry. D. Cam: cam is made by machining and polishing, cam curve is designed by computation to ensure the correct orbit. E. Lifting nut: during equipment debugging and replacement of change parts, lifting nut needs to be adjusted so that the capping could be tight. F. Spiral feeding mechanism: the body is composed of the screw, cardan, rod, plate, reducer and other components. Screw is made of nylon; other parts are made of stainless steel. G. Rotating shaft: it is composed of chain wheel, guide wheel, shaft, bearing, bearing seats. H. Expanding wheels: adjusting expanding wheels can keep the transmission chain of equipment operation in parallel; expanding wheels played a significant role in the system. I. The main frame body: This machine main frame made of stainless steel, with good appearance, high sturdiness and durability. J. Guide pole: high quality stainless steel pipe is machined through grinding machine processing, the surface roughness is less than 0.8, to ensure the smooth operation of rotary head. K. Guide device: the device is a key part of the rotary cover. Caps on the chute is fed onto the bottle body under the guidance. L. Supporting plate device: the device will deliver the cap into the screw head, the rotary head can be held. The machine transmission parts require regular lubrication. There is oil feeding hole on lifting hand wheel bearing socket, and lubrication should be done every half year. The reducer oil shall be washed cleaning and replaced with new oil after one week running, and the oil shall be replaced every 6 months. Lubrication oil is 40# mechanical oil. The speed controller for bearing and spiral feeding mechanism shall be fed lubrication grease every 6 months. This equipment can be installed directly on the working floor, no floor killing is required. During installation, the working platform shall be flat, the level error should be below 1 / 1000mm. The support screw pole shall also be adjusted to ensure the equipment stable. Before commissioning, system shall dry run for checking, then run with empty bottles, and then run with bottles. During initial running, the speed shall not be too fast, check all parts for abnormal at any time, check whether cap screwing force is consistent, whether there is damage of the cap.